Hi everyone, this is my first post! I've already learned alot from reading this forum over the past few weeks. 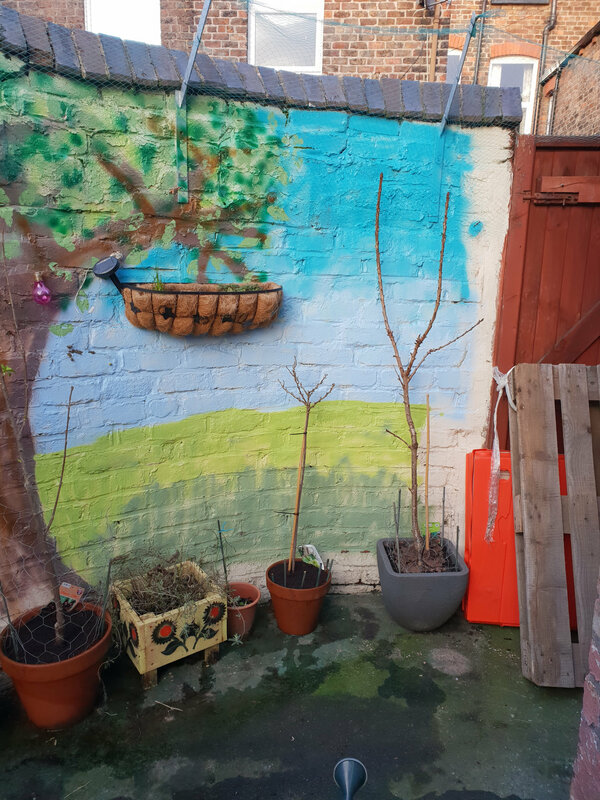 I have a Sylvia cherry tree which needs moving to a bigger pot, but I'm wondering if I've left it too late to do so as I've read early winter is the best time to repot trees. The tree fell over a few times last year as it has outgrown its current pot. I intend to repot in a 50cm tub. My question is, can I safely do this now or is it not ideal? There is currently no leaf on the tree, but I would like to maximise my chances of getting fruit this year. It only bore one cherry last year which did not ripen, but I fed it with Miraclegro, which I now know was a mistake. In the following photo it is the tree on the left of the gate in the grey plastic pot. It has doubled in height from when I bought it after one full growing season in my care. I'd do it now rather than leaving it in the small pot for another summer. I agree. If you can use a soil-based compost, like John Innes no.3, it will provide more nutrients for the tree, and being heavier, will help it not to blow over. Great, thank you both for the advice. I did read that cherry trees should be fed with blood, fish and bone a couple of times a year only as they fruit better when starved (to a degree). Is there a specific time I should do this? And will this be required initially given the John Innes no.3 (if I can find it) will provide nutrition once repotted? can you please go into some detail about the starved to a degree to fruit better please? I have never heard of that. "Feed twice a year with a handful of fish, blood and bone fertiliser. Don't feed with nitrogen rich fertilisers, they will reduce the amount of fruit it produces. To some gardeners this can sound a slightly harsh regime, especially given the adverts for Miracle Gro and other nitrogen rich fertilisers. But for fruit trees in containers, they really do produce the best fruit (in volume and taste) when slightly "starved" of food." Whether the above advice is good advice or not, I'm unsure. However, I fed the tree heavily with a nitrogen based fertiliser last year and harvested no fruit (but it did produce an abundance of foliage), so I'm going to try this approach. I use blood,fish and bone meal,tomato food,liquid seaweed on all my fruit trees and bushes except for blueberries which I then use the the recommend feed,they always say if you want lots of growth use a high nitrogen feed and for flowers and fruit use a high potash feed like tomato feed I hope that helps . When do you feed the blood, fish and bone, and how often?